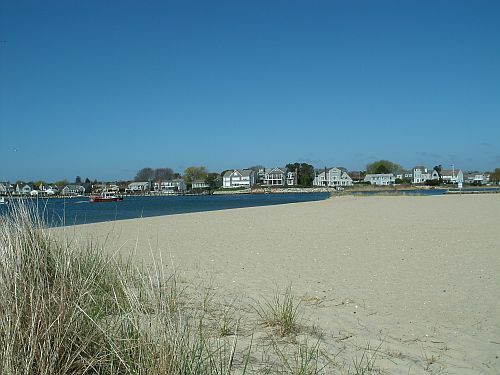 Looking for free beach parking on Cape Cod? This is a nice little family beach with warm, calm, shallow water. There's a play area for the kids and a nice view of the lighthouse on the inner harbor. Parking is limited to about 20 cars. 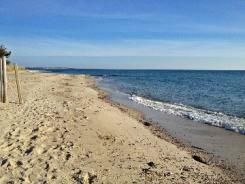 I'd rank Colonial Acres as one of the best free-parking beaches on Cape Cod. 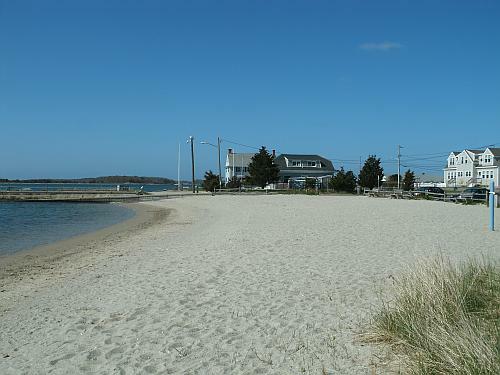 Along with a good-sized expanse of sand to stretch out on, Colonial Acres has wide-open views of Lewis Bay and plenty of room to walk the shoreline. If you're into fishing or crabbing, bring your gear and try your luck in Mill Creek - the saltwater estuary that flows nearby. The parking area has room for about 15 cars. This neighborhood beach looks out onto a small boat anchorage. There's a swing set and a climbing gym for the kids, and enough room to toss a ball or run around and play. On the other side of the boat ramp and pier (at top left in the photo above), there's a more quiet area with open views across Lewis Bay to Sweetheart Cove and Pine Island Wildlife Sanctuary. At dusk, this is a favored spot for watching the spectacular sunsets over Nantucket Sound. There are only about 20 parking spaces here, and they tend to fill up quickly on warm, sunny summer days. Gray's Beach is another of my top recommendations with free parking ... not so much for its size (not very large) or sand quality (a bit grainy), but because it has incredible views and tons of free amenities. For families, there's a pavilion with picnic tables, charcoal grills, and a good-sized playground. There are also plenty of sea-grassy spots where the little ones love hunting for hermit crabs and other sea critters. 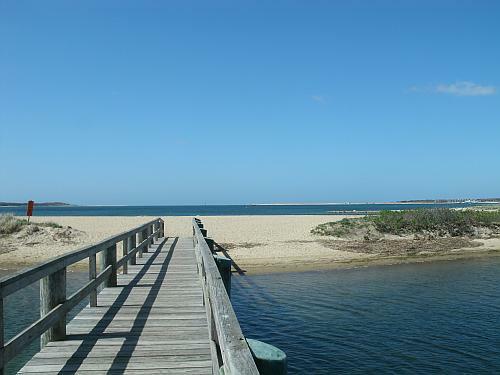 For kayakers, boaters and anglers, the small (unpaved) boat launch gives direct access to the amazing tidal areas of Bass Hole - and fantastic fishing! And for everyone, there's the famous Bass Hole Boardwalk that goes out over the marshland. Sunsets over Cape Cod Bay are breathtaking here. The parking areas here consist of about 50 passenger vehicle spaces, plus 5 or 6 spaces for boat trailer parking, all free of charge. 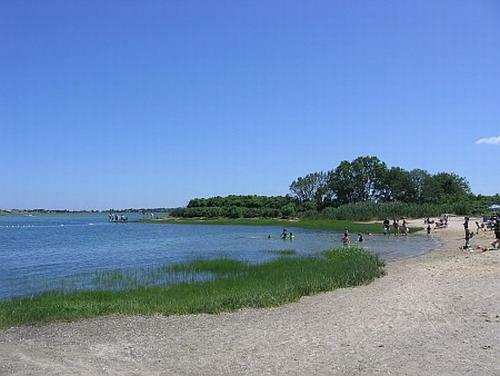 Despite its name, Oyster Pond isn't a fresh water pond. It's a saltpond on an inlet from Nantucket Sound. Its sheltered setting, warm waters, and lack of any real "surf" make it perfect for families with younger children. Picnic tables, a swim platform, bathhouse facilites, and lifeguards (seasonal) are an added bonus. The on-site parking lot has about 50 spaces. 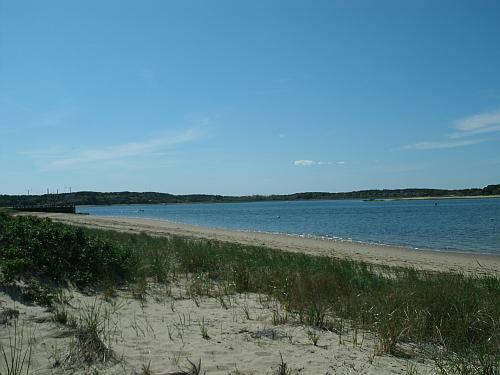 Although these are both relatively small stretches of sand, and they have no services or amenities, they're still worth a visit when you're looking for a free-parking beach in Chatham. If you're renting a cottage in the neighborhood , or staying at the Chatham Tides Inn, you'll easily be able to walk to these Nantucket Sound beaches. Otherwise, it's first come first served for one of the few free, on-street parking spaces. 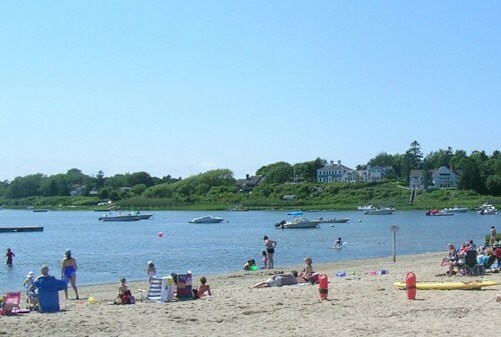 Mayo Beach is a popular spot for budget-minded families with children, thanks to its warm, calm waters and the excellent park and playground just across the street. It's all free to use, along with a decent amount (about 90 spaces) of free parking. If you're planning to spend a some time at Mayo, be forewarned. At high tide, the sandy beach area gets a little skinny. And at low tide, there are miles of mudflats (home to the world-famous Wellfleet Oyters!) between the beach and the water. So do yourself a favor. Check a tide chart for Wellfleet-Cape Cod Bay before you go. The hours around half-tide (midway between high and low tide) are the best time to be here. 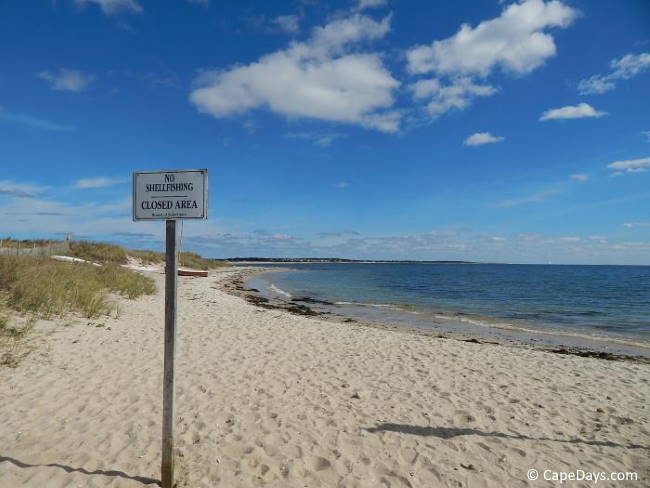 Most Cape Cod beaches have no admission fee. You can walk in or bike in at no charge - even in the summer months. You'll only have to pay if you want to park your vehicle in the lot.